North Korea has test-fired a ballistic missile from a submarine but it failed in its initial flight stage, South Korea's military says. It comes less than three months after a previous attempt to launch a missile from a submarine failed. North Korea, believed to be developing nuclear weapons, is banned by the UN from any use of ballistic missiles. "The SLBM (submarine-launched ballistic missile) was ejected from the submarine normally, but is estimated the initial flight was unsuccessful," the South Korean military said in a statement. It remains unclear exactly where the Terminal High Altitude Area Defense (THAAD) anti-missile system will be sited and who will have final control. Earlier this week, the US imposed sanctions on North Korean leader Kim Jong-un - a move Pyongyang described as an "open declaration of war". This was the first time sanctions have been used against Mr Kim by the US, as it declared him directly responsible for human rights abuses in his country. Pyongyang has reportedly warned that it will close down all diplomatic channels with the US unless the blacklisting is revoked. In January, North Korea conducted its fourth nuclear test , claiming it to be its first using a hydrogen bomb. 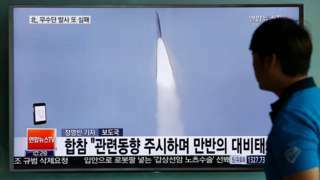 Shortly after that Pyongyang launched a satellite, widely seen as a test of long-range missile technology.